Today is Thursday, March 07, 2013, and I had the long-awaited pleasure of spending this day all by myself. Today is also the anniversary of my mother’s death. She died thirty two years ago at the young age of 47. So, today, I suppose I am grieving this loss, like I do every year. I decided to take a walk at one of my favorite Denver parks today and then spend some time at one of my best “thinking” coffee/tea shops afterwards and write. It is a beautiful, somewhat cloudy day in Denver, and I could not help but ponder what my life would have been like if my mother had not died so long ago. That day changed my life; it left a mark in me that nothing else will touch. It was not until years and years later, however, that I would realize how much of a mark it made, and what I would do with it. But, this blog is not about that. I truly believe the loss of a loved one or the loss of a relationship could be a very traumatic event. There is no getting around it. It happens sometimes unexpectedly (as in my case), and we are left to pick up the pieces. We are left to reconcile the missing piece that is now a gigantic void in our lives. How does one manage to do this without completely losing it or becoming depressed? What can fill that void? Denial and Isolation: We do not want to accept the loss because it is too emotionally overwhelming. This is a defensive mechanism and is temporary. Anger: Once we acknowledge what happened, we are overwhelmed with emotion. We then become angry that the loss occurred. This is normal. We might even blame others for what happened or for what we are feeling. Bargaining: This stage of grief is when we start asking the question, “what if?” “What if I had …?” This is also a defense mechanism in hopes of averting the impending pain associated with grieving. Depression: We now feel sadness and regret during this stage. And, we start to incorporate the reality of our loss into our lives. We might spend time alone during this stage trying to make sense of the loss. Acceptance: The last phase is marked by calm and solace but not necessarily happiness. We have learned to accept what has happened. The goal is to reach this stage in order for healing to take place. Some of us tragically do not make it to this stage. As I strolled through the park today, I noticed the lifeless, faded tree branches just waiting for their leaves to come to life with spring around the corner. These were very old trees with thick trunks and wondrous when their leaves are in full bloom. Some were poised around a small and serene lake. Some were standing tall in the distance. All of them, however, were barren and ready for a change and waiting for spring. I noticed, too, that even though they were all different, there was a “sameness” about them that made them more special to me as I walked. I then realized the trees were like me and you when we grieve. 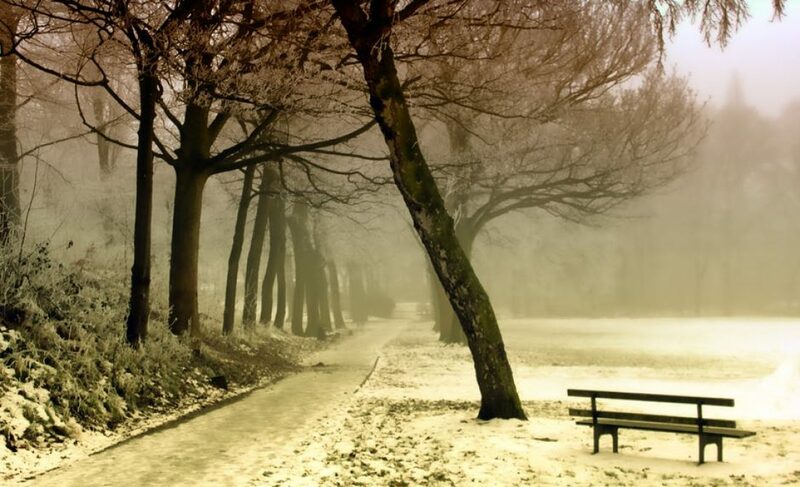 When we grieve, we are mourning a loss; we spend our time in “winter” – in emotional and perhaps physical turmoil; we feel and are left barren like the trees in dead of winter; we experience many “storms” as we try to come to terms with our loss; we are left waiting for our “spring” to bring us back to life. I believe for each one of us there is a different grieving process, but like the trees, we are also similar beings: we all need to release our emotions that stem from the loss we are experiencing. If you have recently lost someone you loved, via death or the loss of a relationship, you are entitled to take the time to grieve. There is no way around grieving but to experience the process. It is also a highly personal endeavor; there is no right or wrong way to grieve. What keeps us from healing faster and thus entering spring, is not allowing ourselves to cry, to scream, to let go of our bottled emotions. When our pain is not released, we continue to reside in “winter” and do not allow the spring to make us new. If you are stuck in winter, I encourage you to let go and let spring take over. You are worth it! Every year of mourning the loss of my greatest influence, my mother, is different for me. Some years are more like winter and some are more like the small beginnings of spring. Today, I am finding myself in a contemplative mood thinking about what Mom meant to me and how that devastating loss has heightened my personal awareness about so many aspects of life and of how the experience has changed me. And, I feel that it is all good. I feel spring. Categories: Grief & Loss | Tags: Death, Dying, Grief, Grieving, Inspiration, Loss, Stages of Grief, Stages of Grieving, Vilma Reynoso | Permalink.